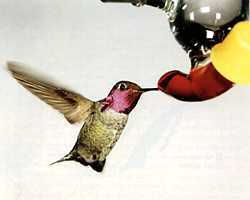 Anna's is the most common hummingbird in southern California, and one of only three species that are permanent residents of the US or Canada (Allen's and Costa's are the others). Unlike most other hummers, Anna's has a (minimal) song. 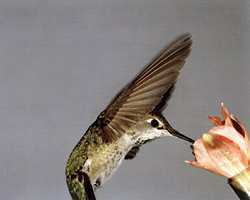 Average weight: male 4.31 g, female 4.07 g. The Anna's is the largest hummingbird seen on the west coast. Adult male: Metallic green back, dark rose-red crown and gorget, grayish breast. Adult female: Green back, grayish-white breast, white throat with some red spots, white tips on outer tail feathers. Juveniles: Young of both sexes look like the adult female, but may have unmarked throats. For maps showing population distribution and trends, see the USGS species account.